This is a very common swamp and roadside bird (when water's nearby). 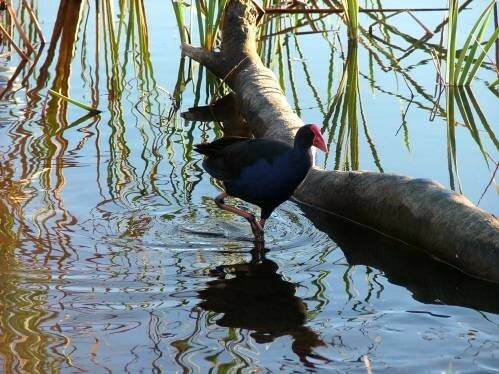 A native of New Zealand and happily living in the bullrushes around the Hamilton Lake. That bird is a real high stepper! I like the colors of the reflections in the water. Lovely photo of a swamp bird. I love Pukeko's. I'm glad there's a protection on them. I see a big difference in your photography now. This is beautiful.